French police are investigating a scandalous video of officer misconduct against migrants in the port town of Calais, where thousands of asylum seekers from Africa and the Middle East are stranded hoping to cross the English channel into UK. “The exact circumstances of this intervention will be rapidly examined... and any failure to apply the ethical rules will be punished,” the police said in a statement on Tuesday. A video, published earlier this month by the Calais Migrant Solidarity, shows cutaways of police brutality filmed on May 5th, immediately after Interior Minister Bernard Cazeneuve visited the migrant camps on the outskirts of the city. The video montage shows several scenes of what appears to be French police officers insulting and attacking migrants, all recorded in just one day. One scene depicts a policeman removing a man from a truck and pushing him violently over the guardrail. Other scenes show pepper spray being used as well as other forms of physical harassment such as beatings. The entire piece of footage is filmed from a distance and shows the CRS riot police engaging those hiding in the back of UK-bound trucks. Most of those being abused are asylum seekers searching for a better life after fleeing conflicts mainly in Africa, from places such as Sudan, Ethiopia and Eritrea. 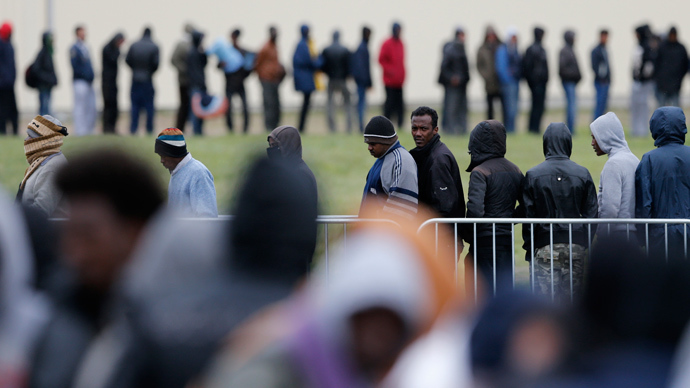 The NGO says that migrants are forced to leave France instead of applying for asylum there. “Treatment by police, a lack of housing for asylum seekers, and delays in the French asylum system had deterred them from seeking asylum inFrance,” HRW said. Boyko says that no medical attention is offered to those that suffer those injuries. She recalled one story of an 18 year-old Libyan boy who could not walk or stand on his leg because it was “so badly injured,” after being brutally assaulted with batons by the police. French authorities remain under tight pressure to clear migrants camps in the vicinity of Calais. Fearing discrimination, few migrants opt to seek asylum. Only 885 applied using formal paperwork in 2014 and 399 in 2013, in comparison to several thousand refugees being present at any one time in Calais.